This work deals with electronic states and infrared spectra for benzamide and di-chlorine benzamide molecules from density functional theory calculations. The calculations are carried out using B3LYP/6-31G level of theory. The results showed the lowest unoccupied molecular orbital in all molecules are greater than the higher occupied molecular orbital, these structures need high energy to donating an electron. Para di-chlorine benzamide molecule has the lowest energy gap. The vibrational modes of the molecule have been increased with increasing of bonds with new peaks in low range of frequency were appear due to presence of amin subgroups in the molecule. Benzamide is an off-white solid with the chemical formula of C6H5CONH2. It is a derivative of benzoic acid. It is slightly soluble in water, and soluble in many organic solvents. Amide is a group of organic chemicals with the general formula RCO-NH2 in which a carbon atom is attached to oxygen in solid bond and also attached to a hydroxyl group, where 'R' groups range from hydrogen to various linear and ring structures or a compound with a metal replacing hydrogen in ammonia such as sodium amide, NaNH2. Amides are divided into subclasses according to the number of substituents on nitrogen. The primary amide is formed from by replacement of the carboxylic hydroxyl group by the NH2, amino group. An example is acetamide [1-4]. Amide is obtained by reaction of an acid chloride, acid anhydride, or ester with an amine. Amide can be formed from ammonia NH3 . The secondary and tertiary amides are the compounds which one or both hydrogen in primary amides are replaced by other groups [4,5]. The names of secondary and tertiary amides are denoted by the replaced groups with the prefix capital N (meaning nitrogen) prior to the names of parent amides. Low molecular weight amides are soluble in water due to the formation of hydrogen bonds. primary amides have higher melting and boiling points than secondary and tertiary amides . Benzamide, the simplest aromatic carboxylic amide, is used in the synthesis of various organic compounds. Polyamide is a polymer containing repeated amide groups such as various kinds of nylon and polyacrylamides. Benzamide was used to study the mechanism of photocatalytic decomposition of aqueous solution of acetic acid, acetamide and acetonitrile in the presence of semiconductors. It was used to develop a robust screening method to study biotransformations using (+)-γ-lactamase enzyme. Benzamide on radioiodination by different labeling procedures results in large-scale production of radioiodinated benzamides having potential therapeutic application for patients with metastatic malignant melanoma. The structures of the benzamide and chlorine-benzamide molecules in Figure 1 are relax by employing the three parameters Lee-Yang-Parr B3LYP density functional theory at 6-31G basis sets using the Gaussian 09 package of programs. These structures are the benzamide as the original molecule, di ortho-Chlorine-benzamide, di meta-Chlorine-benzamide and di para-Chlorine-benzamide and they are labeled 1-4, respectively. Figure 1: The relax structures of the molecules under study. Table 1 illustrates the total energy Etot, electronic states (HOMO and LUMO) and the energy gap Eg of the studied structures. As shown the total energy was decreased with increasing the number of chlorine atoms in the molecule but it is approximately independent on the position of di chlorine atoms in the terminal ends of phenyl rings. Table 1. The Etot, electronic states and energy gap Eg of the molecules. From above table, the LUMO energies are greater than the HOMO energies in all molecules, in which, these molecules have low electron affinity and high ionization energy, all need high energies to donating an electron. The LUMO-HOMO energy gap in Table 1 showed the benzamide molecule has the largest value of Eg, adding the chlorine atoms reduces the Eg. Pare-di-chlorine benzamide molecule has the lowest energy gap (3.807 eV), this an indication to construct a new molecule has a new electronic structure. Figure 2 declare the 3-D distribution of the two frontier orbitals, the High Occupied Molecular Orbital (HOMO) and the Low Unoccupied Molecular Orbital (LUMO) for the studied molecules constructed from the linear combination of atomic orbitals in each structure. Figure 2 showed the oxygen atom and amine subgroup in benzamide molecule have the significant contribution in both HOMO and LUMO. In the di-chlorine benzamide molecules, the contribution in the HOMO and LUMO is due to presence of the two chlorine atoms in the benzamide molecule, also the positions of chlorine atoms are play role in the constructed molecular orbitals. 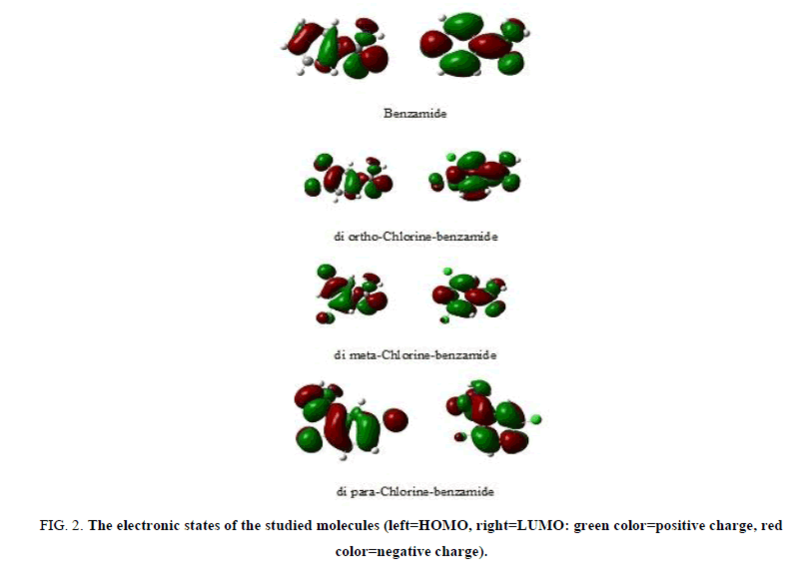 Figure 2: The electronic states of the studied molecules (left=HOMO, right=LUMO: green color=positive charge, red color=negative charge). 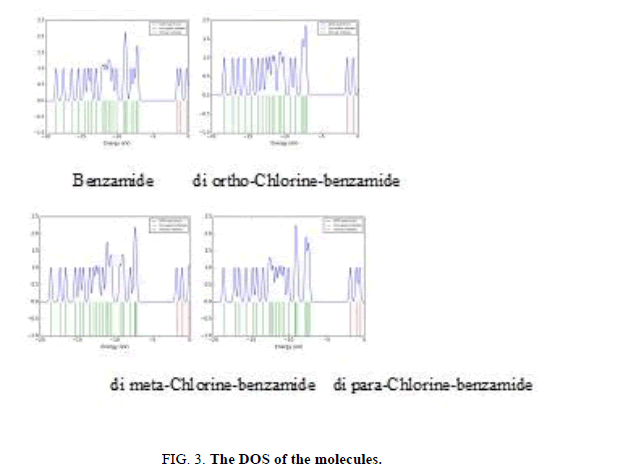 Density of states DOS in Figure 3 for benzamide molecule was affected by adding the chlorine atoms in the terminal ends of phenyl rings, di-chlorine benzamide molecules have large number of degeneracy of energy levels in comparison with the reference benzamide molecule. DOS for a molecule were change due to the number of the degeneracy of the energy levels. Figure 3: The DOS of the molecules. Figure 4 shows the infrared spectra of the molecules under study. The number of modes of the vibrational frequencies are calculated according to 3N-6, they calculated for benzene molecule using B3LYP/6-31G method appear peaks at (691, 1066.3, 1528.28 and 3202.34) cm-1. By comparison these results with experimental results, it has been found that the calculations of B3LYP/6-31G method are in a good agreement with experimental data, where the peaks had been observed at (673, 1038, 1469, and 3210) cm-1. The strong peak computed by B3LYP/6-31G observed at 691 cm-1 and weak peak at 1066 cm-1 are due to the bending of (C-H) bond, the peak observed at 1528 cm-1 is due to the stretching of (C-C) bond, the peak at 3202 cm-1 is due to the stretching of (C-H) bond. The presence of oxygen atom and amine subgroup in the benzamide molecule gave peaks appear in low range of frequencies. 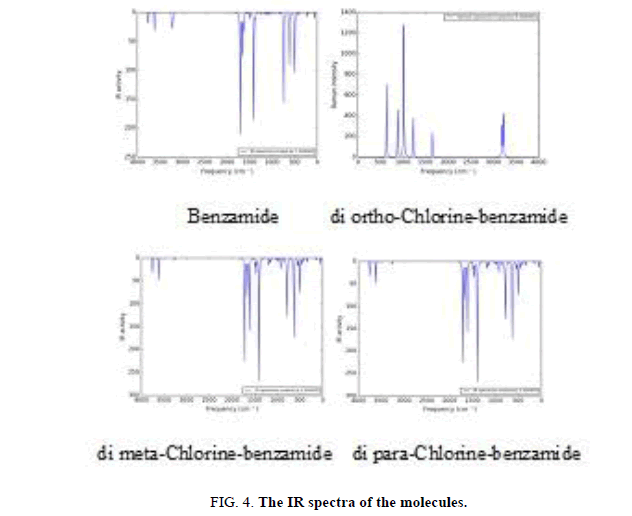 Figure 4: The IR spectra of the molecules. 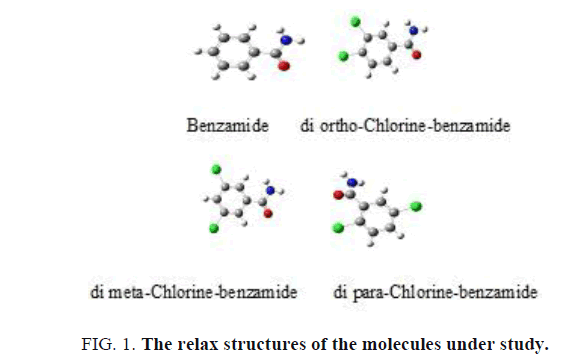 By comparison the IR spectrum of di-chlorine-benzamide molecules in Figure 4 with the IR frequency of benzamide molecule, it will be noted the differences between them, and it has been deduced that the differences due to the addition of chlorine atoms, where the vibrational modes have been increased with increasing of bonds, consequently the peaks have been increased. It is observed from Figure 4 that the IR spectrum for these molecules characters from that of benzene molecule by multiply the vibration mode due to existing of (N-H) bonds and (C-N) bonds, the stretching and bending of these bonds due to new peaks or band of peaks to be appeared, the stretching (C-N) bond has been observed at (1200-1350) cm-1, and the stretching (N-H) bond has been observed at (3200-3600) cm-1, while the bending of (N-H) bond appeared at (1550-1650)cm-1. The lowest unoccupied molecular orbitals in all structures are greater than the high occupied molecular orbitals in which these structures need high energy to donating an electron. So, all structures have electron affinity lower than the ionization energy. On the other hand, adding the chlorine atoms leads to decreasing the energy gap. Pare-di-chlorine benzamide molecule has the lowest energy gap, this an indication to construct a new molecule has a new electronic structure. It has been found that the calculations of infrared spectra of benzamide molecule from the B3LYP/6-31G method are in a good agreement with experimental data. The presence of oxygen atom and amine subgroups in the benzamide molecule gave peaks appear in low range of frequencies, the vibrational modes of the molecule have been increased with increasing of bonds, consequently the peaks have been increased. Burgi HB, Dunitz JD. Structure Correlation Weinheim. 1994;2:767. Kuevi UA, Kouznitsov SL. Mémoire de master, study of complex formation of zinc (II) and copper (II) benzamide, N, N'-dimethylbenzamide and succinimide. URAP Moscou, French. 1992. Hickey AM. A Microreactor for the study of biotransformations by a cross-linked gamma-lactamase enzyme. Biotechnol J. 2009;4(4):510-6. Park KH, Kim JH. Photocatalytic decompositions of carboxylic acid derivatives by semiconductors. Korean Chem Soc. 1991;12(4):439. Mier W. Radiopharmaceutical therapy of patients with metastasized melanoma with the melanin-binding benzamide 1311-BA52. Journal of Nuclear Medicine: Official Publication, Society of Nuclear Medicine. 2014;55(1):9-14. Yi HB, Lee HM, Kim KS. Interaction of benzene with transition metal cations: Theoretical study of structures, energies, and IR spectra. J Chem Theory and Computation. 2009;5(6):1709-17.